One person died and seven others were injured when two big rigs and a minivan collided in the McClure Tunnel in Santa Monica. One person died and seven others were injured when a big rig, a dump truck and a minivan collided in the McClure Tunnel in Santa Monica. 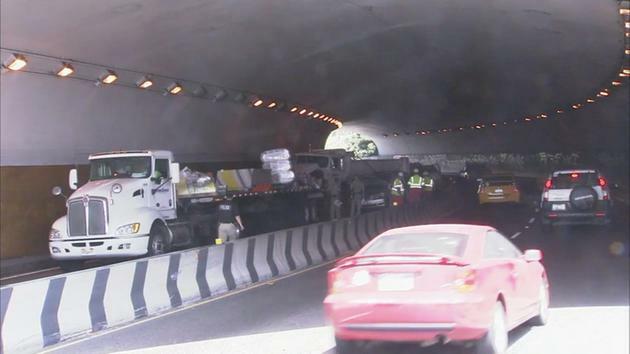 The crash was reported in eastbound lanes in the McClure Tunnel at 12:37 p.m. Friday. Eight people were rushed to area hospitals, where one person died. One person remains in critical condition, and six others are listed in moderate condition. "It appears one of the vehicles didn't see stopped traffic ahead in the McClure Tunnel, and that was probably the result of this collision," said a CHP officer on scene. All lanes of the 10 Freeway were closed between Pacific Coast Highway and Lincoln Boulevard. At 2 p.m., eastbound lanes were reopened, but westbound lanes remained closed. Authorities say the tunnel is closed for the accident investigation until further notice.